Two years ago, just as I was about to see The Dark Knight Rises, I wrote a glowing overview of its director's career. A huge fan of Christopher Nolan since his second feature, 2000's Memento, I explained how he had almost single-handedly restored my faith in blockbusters thanks to his Batman films and 2010's Inception. Where other filmmakers were content to make summer spectacles that were big and loud and not much else, his felt legitimately epic, the scope of their imagination rivaling their budgets. "As a film critic, I rarely get personally invested in the people who make movies," I said then. "But I find myself actively rooting for Christopher Nolan to knock it out of the park with The Dark Knight Rises. He's given me more great summer-movie memories than anybody in a long time. But I'm greedy, and I want just one more." Even when I wrote that, I worried about a letdown. Past success doesn't guarantee future greatness, and wouldn't it be awful if The Dark Knight Rises was a total dud after the terrific first two installments in the trilogy? My pro-Nolan piece went live about an hour before I walked into the screening, hoping for the best. The Dark Knight Rises wasn't a dud, but it introduced something new into my Nolan fandom: an element of doubt. Where even imperfect previous films like 2006's The Prestige and 2oo2's Insomnia felt like the work of a meticulous craftsman—someone who knew exactly what he was after—his third Batman film was unwieldy and unfocused, a big mess of good and mediocre all smashed together. It was the first time that Nolan didn't seem fully in control of his material, creating the impression that he'd made the movie mostly out of obligation to completing the trilogy. A guy who came of age loving films like Snow White and Star Wars, he didn't seem to have his heart in this one, which was doubly disconcerting, since it was the emotional sweep of his biggest movies that helped make them so indelible. I could allay that worry by telling myself that Nolan has given me plenty of great films—and besides, The Dark Knight Rises was still such an ambitious, occasionally arresting movie that it felt petty to nitpick. At least he was aiming for the stars—how many other blockbuster directors could make that claim? With his new film, Nolan pilots us literally to the stars, and while Interstellar is a more confident, absorbing, and stunning experience than The Dark Knight Rises, that nagging worry is only growing. What was once so strong in Nolan's films—his ability to work on a large canvas without sacrificing smarts and heart—is only in evidence from time to time here. This is easily one of the most adventurous, nervy studio movies in a while, summertime or otherwise. Its mere existence reassuringly reminds us that Hollywood hasn't completely lost its ability to let talented auteurs dream bigger. I'm just not sure Nolan is dreaming better. 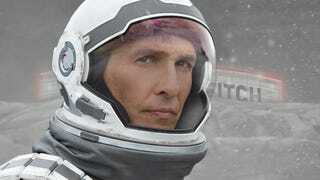 Interstellar stars Matthew McConaughey as Cooper, a former pilot living in a not-too-distant future where planetary environmental concerns trump space exploration. Now a farmer living with his two young children—his wife died of cancer—Cooper crosses paths with a scientist (Michael Caine) who lets him in on a secret: Earth is doomed, and won't be able to sustain life within about 40 years. The only hope for humanity is if Cooper captains a manned space mission to Saturn, where a wormhole has appeared, leading to possibly hospitable planets on the other side of the universe. Drawing plenty of inspiration from 2001: A Space Odyssey—Nolan's favorite film, and mine, too—Interstellar has the visual poetry of Kubrick's sci-fi colossus but way more plot. Much like Inception, it runs well over two hours in part because it takes a while to explain everything . To a certain degree, that's not a problem, since that exposition can be fascinating: Stressing authenticity in his movie's treatment of outer space, Nolan hits us with the immense complexity and challenge of traveling from planet to planet. (This isn't a movie where warp-drive makes getting around a breeze.) But the complexity of the explanations starts to suggest the difficulties that Nolan has had with his recent films: They're such massive undertakings, so self-consciously momentous, that they have trouble breathing. From Inception on, Nolan's movies have been distinguished by the sheer amount of stuff going on, not just in terms of story, but also the number of characters running around. It wasn't enough that Leonardo DiCaprio was trying to execute his latest assignment and reconnect with his dead wife—Inception was also an Ocean's Eleven-style heist movie with tons of supporting players, several of whom had distinct personalities and mini-arcs. The juggling got even tougher on The Dark Knight Rises, where Nolan had to bring back all the major characters from the first two Batman movies while introducing a whole fleet of new villains and heroes. And yet, with all that going on, you missed the simplicity of Heath Ledger's psychotic Joker. Now, with Interstellar, there are again plenty of characters, and again the sense that Nolan has too much on his plate. It isn't just about outer space, of course: In typical Nolan fashion, the movie has an emotional underpinning in which the grandness of its vision is offset by an intimate relationship story, this time between Cooper and his distant daughter Murph (played by Mackenzie Foy as a girl and Jessica Chastain as an adult). But the intensity of focus Nolan used to bring to his films has recently become diffuse. Just about everybody here wants something: Anne Hathaway's scientist has a secret motivation for joining Cooper's mission, Jessica Chastain's daddy's girl eventually gets involved in trying to save Earth, Michael Caine plays yet another mentor figure in a Nolan movie, and a surprise cameo from a major star adds another important character to the mix. Normally, it's the sign of a good script when even the supporting characters are given dimension, but Nolan risks overwhelming us. There's a lot happening thematically, intellectually, and creatively in Interstellar, but the cohesion he used to bring to his work seems to have drifted away. Nolan's recent desire for narrative expansion seems to be the downside to the unqualified success of 2008's The Dark Knight, which enlarged the universe of 2005's Batman Begins so brilliantly without sacrificing the close identification with its major players. As a consequence, Nolan has moved from being just a master craftsman to a widescreen showman, wanting to dazzle us with his every crescendo. His vision of a Hollywood blockbuster is still vastly superior to that of his competitors, and much of Interstellar will knock you sideways. But for a filmmaker who treats his movies like intricate puzzles, his latest feels awfully rickety in places, as if the big moments are more important than the small ones. Worryingly, he's become a magician who mostly seems concerned about the big reveal, not realizing that the buildup and presentation are just as important. "Films are subjective—what you like, what you don't like," Nolan once said. "But the thing for me that is absolutely unifying is the idea that every time I go to the cinema and pay my money and sit down and watch a film go up onscreen, I want to feel that the people who made that film think it's the best movie in the world, that they poured everything into it and they really love it." That's a commendable attitude, and one other Hollywood filmmakers should remember, and without question, Interstellar embodies it. But the movie also suggests that sometimes, love isn't enough.